In 1967, two designers, Robert Propst and Herman Miller ventured to improve the privacy and lower the buzzing level of confusing distraction that office workers had been living with. They invented what they called, the “action office.” Recognizing that people are more productive working within their own territorial enclave that they can personalize, the inventers found a way of making walls around desks to provide flexible mini-office spaces. 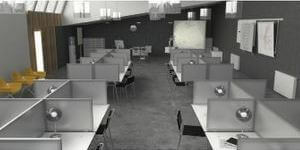 Propst’s concept was to structure desk space with two or three-sided vertical divisions that defined a territory and provided walls for privacy and without hindering the ability of workers to view and participate with others. These walls were are also entirely flexible and adaptable allowing for multipurpose use. The idea of the “action office” was nearly universally adopted by 2005. The desk mount allows offices to construct privacy spaces around the structure of individual desks flexibly and without damaging the furniture itself. Desk mounted privacy panels easily attach to the desks themselves using special mounts. They come in a variety of custom colors, frames and fabrics to enhance and match any office décor. The desk mount system quickly transforms open office designs into mini-office space which a person can call their own. The carrel structure afforded by these desk-mounted panels also provides privacy for study in libraries or special classrooms or test-taking environments. Recent studies have shown that students with certain forms of learning disability function much better within structures defined by carrel spaces that cut off peripheral distraction. This year marks 45 years since the invention of the “action office.” The concept has revolutionized the work environment of millions of busy offices. OBEX desk mounted panels can improve any open office environment. Please contact us to explore the options we offer.